Photo courtesy of Brandon Dawe. Cacao beans vs. Human beans. Chocolate isn’t charming? Then why is it such a popular gift on Valentine’s Day? Try the new chocolate assortment – Humankinds. How do you goncharoff, and will it make you go blind? The long, dramatic and glorious history of chocolate taught us that the very excellent, luxurious, passionate, intelligent, charming and delicious color and sweetness come from a single secret ingredient: Cacao Channel No. 2. I have no beef with Kobe. Chocolate has a long, dramatic and glorious history. Then it reaches its “best before” date. When I was single, I used to give my lady a bottle of liquor not chocolates. If you eat Japanese chocolate, will you start speaking ancient Latin? Was Choco late because Kobe messed with beans and went nuts? 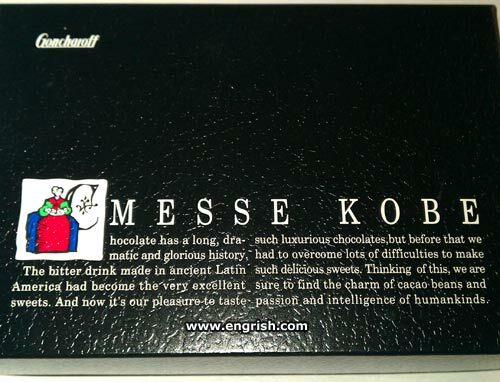 Chocolate leaves some nasty stains, though: it’s a pretty Messe business. Every kid knows nothing beats messe chocolate! Try saying that in Nahuatl*, choco-boy! @Marum-That was written by Ogden Nash. Long Tom. 1756. Danke, mein gütig Herr.